← What would you change? Finally, could one model the northern end, at Oscar’s junction, or the southern end, at Watts, of the four-track main line? The prototype track layouts below are taken from the Model Railroader article. Both have real potential as stand-alone layouts, but may need some adaptation for modular use. I haven’t drawn these up, as yet, but just suggested a few modifications for modular use. Perhaps Oscar’s Junction is the easier of the two. There are four tracks all the way through from the Watts end to the Eighth Street Yard leads. One would, however, have to accept trains running through the small yard on the opposite side of the tracks to Long Beach Avenue. Incidentally, the metal sheds in the yard were still standing just a few years ago. If building this for N-mod, it might be best to flatten out the gentle S-curve of the prototype. The double track lines leading to Main Street Terminal could provide an N-club link, provided an extra link was added between the double track section and the small yard. Perhaps there is indeed potential for Oscar’s Junction and modules? Watts is rather more difficult. The station itself and the single freight road would be easy to model. The slips and crossovers leading from all four tracks into the car shed and yard would also be easy to model, although care might be needed in track laying with the slips on the main lines. The main modular challenge is the triple junction, as the main lines scatter to various destinations. One option would be to simply run four tracks past the car shed and keep the linear modules. This would look good, and make an interesting model, but it would loose something of Watts’character. A better option would be to modify the track layout slightly, so that one of the three lines (probably the one to Long Beach) becomes a dummy junction. The other two double-tracked lines could then link up in a loop and form an end loop for an N-mod linear layout. Looking more closely, the links are actually already there – the Santa Ana line can run from tracks 1 and 3, and the Torrance line from tracks 2 and 4. This would need an operator in charge, as there is a diamond crossing where lines 2 and 3 cross! Yes, Watts is difficult, but it still has potential for an N-mod layout. 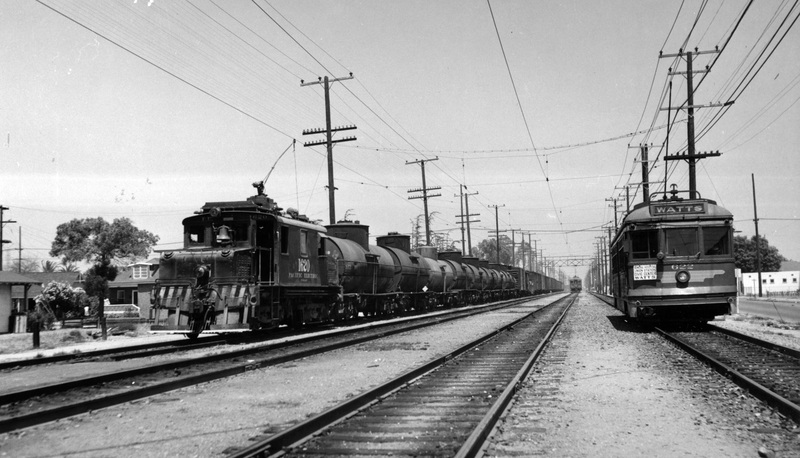 And here’s a final photograph, taken just north of Watts in 1948 (by G. Krambles) showing the character of the main line. Maxine and I have just had a long weekend in Berlin seeing our eldest daughter. Hopefully, I’ll have been allowed to look at a few trains or trams, and there will be photos to follow…. This entry was posted in Inspiration, Layout design, Prototype, Traction and tagged inspiration, layout design, modular layouts, N gauge, Pacific Electric. Bookmark the permalink.